The harmony of the mind and body is the best way to experience total health and wellness. We have designed our massage chairs to use the most advanced technology based on holistic techniques that have been honed over thousands of years. Chronic pain, whether from injury, headaches, back pain or conditions such as fibromyalgia, can interfere with activities of daily living: in the home, workplace and community. Chronic pain is persistent. Regular personal massager heals only surface of tissue. Even though you feel great after using it, it will keep coming back. If you suffer from pain and want get rid of it, you need to break the root of the cycle. 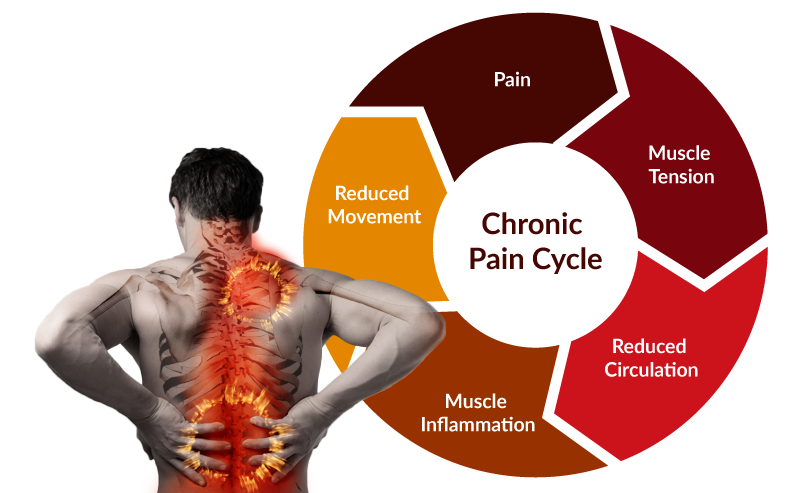 Daiwa Massage Chairs can stop your chronic pain cycle. Chronic pain is a huge and growing problem among young and aging Americans alike. Massage can help break the cycle of pain with its ability to address most of the pain cycle elements. Using specific techniques massage can relieve muscle tension and release trigger points. Muscle stretching and improved circulation from massage can prevent their return. When muscles are relaxed this reduces pressure on nerves, relaxes the nervous system and promotes blood vessels to dilate and increase circulation. This in turn relieves related pain in distant sites. Increased circulation flushes away irritating waste products and provides healing oxygen and nutrients. Certain techniques increase the pliability of adhesions. Along with reduced muscle tension, this helps to restore normal movement and prevent new injuries. How can Daiwa relieve chronic pain? Massage rollers rotate naturally and change direction to vividly mimic real massage movements for bidirectional shiatsu massage with deep tissue kneading, which effectively relieves stiff muscles on shoulders and neck. Daiwa has been a pioneer in personal wellness, which is why we are now a leading manufacturer and distributor of luxury massage chairs in the United States. The Japanese word for “great harmony,” our company name conveys our mission: to help all parts of your body work together and achieve personal wellness through therapeutic massage. Our superior quality control comes from the fact that we do everything in-house. Japanese experts carefully design our chairs in California, and we have them manufactured in our factories in China. We ship directly from our own warehouses throughout the United States, which also house our service centers. We don't rely on third-party services so that we can ensure the best quality service at every stage: from design, to sales, to aftercare and support. We are here to support you throughout the lifetime of your Daiwa chair. Our dedicated Customer Support staff is available by phone during normal business hours or at any time using our online forms: Sales Questions or Repair Service. A unique feature of our company is the fact that we have facilities in locations throughout the U.S., including Hawaii, so that we can ensure fast and reliable service. We are committed to making your purchase hassle-free, and your massage experiences unparalleled. Daiwa models are developed based on our customer-centered research into the holistic health benefits of therapeutic massage. Our engineers have carefully designed each Daiwa chair to take advantage of cutting-edge technology and manufacturing. Every new feature that we introduce is the result of rigorous quality control testing and user feedback. We test and upgrade our products on a constant basis, and develop new merchandise according to consumer needs and demands. GET FREE GIFT with your purchase! To celebrate our showroom opening, we are offering a FREE GIFT with any purchase at our Las Vegas showroom! Just let the sales person know that you saw this webpage when you buy. Being an active member of the Las Vegas community is really important to us. We are here to serve you. In addition to being able to try out our massage chairs in person, you’ll have the opportunity to talk with our experienced massage chair experts, and meet other people who have also discovered the benefits of being a massage chair owner. Seeing is believing, and visiting is a great way to experience our chairs, and ask our expert questions. You can get special promotional price from your purchase. Just let the sales person know that you saw this web page! *This discount can only be applied at trade shows. It is not applicable for Sam's club, Costco or any other stores. Why our massage chair the best?